I started the week out with a Wham Bam then general living got in the way. Now, here I am on Sunday evening finally with some finished art. 1st up I've got a tile for the diva's challenge that you can find the link to above. 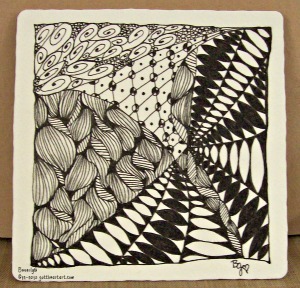 I had never done the tangle African Artist before so I had to do a bit of practicing. I don't know that I really have gotten a good take on it yet, but here it is combined with Spinners, Ansu, and Yoga in a string of my own making. 3 more posts to make because I don't like to clutter up one post with too many links. I like this tile, where I'm drawn to the center. Very nice how you designed it into the center. Good choice of tangles too!